At Mercator Cargo we closely monitor worldwide manufacturing and sourcing trends. The recent increase in trade from Vietnam shows the move away from China to other countries, demonstrating the region as one potential new area for traders and manufacturers looking to source cheap, reliable products. This, of course, is nothing new – like the move away from Europe to China which has prevailed in the previous decades, driven by the increase in the standard of living in China which has increased labour costs driving up manufacturing costs. The latest move by the USA President, Donald Trump, to increase tariff/duty rates on goods from China will add further pressure to the Chinese manufacturing community. Many US Companies are looking to source goods from outside of China. It makes sense for the rest of the world to follow this trend and begin to look elsewhere, facilities manufacturing goods for the USA will also be able to manage the production of goods for the EU and the rest of the world. We have excellent partners in Vietnam who not only can provide us with low freight rates for both air and sea, but who can also assist in finding trusted, reliable partners for your manufacturing and sourcing needs. We can also bolt on added services such as warehousing and consolidation. As Vietnam, and other Asian countries continue to grow we forecast these markets will be the “new” China in a few years’ time, and we are excited to be at the forefront of this new era. Cargo Week Americas and Expo Carga are running this June in Mexico City. The aim of the international trade exhibition is to allow members of international trade to meet and discuss business together. It is a great networking opportunity, and Mercator (and independent, international freight forwarder) will be in attendance this year. Paul, our MD, will be representing Mercator Cargo on the Marco Polo Line stand (Stand Number 423). Marco Polo Line (or MPL) was set up as a global network for independent freight forwarders like Mercator. We are proud to be a founding member of this international network. As a part of MPL, Mercator has strong relationships with other freight forwarders around the globe. This allows us invaluable local knowledge and personal contacts where ever your cargo goes. If you import into the UK or export from the UK, you are most likely to either have a freight forwarder, or will be looking to choose a freight forwarder. Does your freight forwarder have links to or experience in importing or exporting to your origin or destination countries? Here at Mercator, we are part of a global network of independent freight forwarders. This means we have a personal freight forwarding contact in virtually every country in the world, allowing us to draw on local knowledge that other freight forwarders may not have access to. Does your freight forwarder have time to spend talking through options and processes? As an independently run freight forwarding agent, Mercator’s experienced freight forwarders have the expertise and the time to deliver a first class service. When you choose us as your freight forwarder, you will be assigned a personal contact, your logistics expert if you like. This freight forwarder will be personally contactable via email and telephone, and will keep you updated with your shipment every step of the way. It is not coincidence that our first customer back in 1991 is still our customer today. Does your freight forwarder listen to your forwarding needs and the needs of your business? We understand that it is important for your freight forwarder to be working with you. This is why we will do our upmost to deliver your goods on time, and keep you in the loop throughout your shipments movements. Can your freight forwarder cope with a complicated shipment? As an independent freight forwarder, we have the time and the expertise to deal with complex shipments. Whether you have an out of gauge cargo shipment, or a delicate load, Mercator Cargo can assist you. If the above points are important to you and your business, why not give one of our freight forwarders a call to discuss how we can help your business. Even if you’d like to just have a chat and get a quote, you are under no obligation to take up our services if you decide not to. So to compare our service with your current freight forwarder, give us a call today – Tel. 02392 756 575. Email: sales@mercatorcargo.co.uk. Are you Thinking of Expanding your Business to the Global Export Market? As we are now in 2013, you may be thinking of expanding your UK based manufacturing business. Perhaps you have a product that is selling well in the UK, but you’re considering the global market place. Freight forwarding might seem a daunting area for new exporters, but we’re here to help. As experienced freight forwarders based in the UK, we can offer a comprehensive service to all our customers, both large and small. As a family-run, independent freight forwarder, we are able to take the time to guide you through exporting your UK manufactured goods to the global market. Mercator offers air, sea and road freight worldwide. We are rather unique in that we are a founding member of a global network made up of other independent freight forwarders like us. This allows us personal contacts in almost every country around the world, and invaluable, local knowledge. Think you might need hand-holding the whole way? No problem. We are well versed in introducing the procedures to new exporters. Need advice on different options? Mercator can offer advice on ocean freight, air freight and road freight, including costings, transit times, and any local charges you may incur at your goods destination. Mercator began trading over twenty years ago, and our first customer back in 1991 is still our customer today. If you’re still wondering if we’re right for you, why not give us a call on 02392 756 575, or email sales@mercatorcargo.co.uk, and either George or Jess will be in touch about your export freight. Gulftainer has won a bid to develop and run a new container port in Tripoli, Northern Lebanon. An investment of $60 million will fund machinery for the new port, including three ship-to-shore gantry cranes, nine yard cranes and up-to-date technology to manage the yards and containers in the new port smoothly. Once the port has been completed, it will be able to receive some of the largest container ships in the Eastern Mediterranean. The new Port of Tripoli will alleviate some of the congestion at nearby Port of Beirut, and an alternative terminal to that of Tartous and Lakakia in Syria. The new port will provide another route for imports and exports to Iraq from the Mediterranean Sea. This will cut transit times from Europe to Iraq, allowing cargo to pass through the new Tripoli Port and travel via road to its destination in Iraq. Currently the Umm Qasr Port (Iraq) and the Gulftainer Port in Tripoli (Lebanon) are not linked via rail, although it would only take 31km of track to link the two ports. Call Mercator today to discuss your shipment to or from Lebanon – Tel. 02392 756 575. Email: sales@mercatorcargo.co.uk. Mercator can offer shipping services for abnormal loads and oversized cargo. Examples of loads we are able to deal with include yachts, planes, locomotives, wind generators and propellers to name a few. Cargo of this nature needs to be handled with care for loading and unloading and specially secured during transit by sea. Mercator can arrange for your oversized load to be transported in the safest and efficient way. With over twenty years of experience in the freight forwarding business, our team of freight forwarders have the knowledge and experience to be able to advise you about options when shipping your out of gauge (OOG) cargo. Arranging for cargo which does not fit into a standard container requires experience and full understanding of possibilities when it comes to ocean freight. Some freight services on offer include flat-rack, RoRo (roll-on, roll-off), timber beds, hiab/crane deliveries and low loaders. With Mercator’s team of freight forwarders, we can assist you in arranging the safe transportation of your oversized cargo load. Call us today to discuss your out of gauge (OOG) cargo shipment with details of rough dimensions and weight – Tel. 02392 756 575. Email: sales@mercatorcargo.co.uk. Just a few weeks ago, the port of Southampton in the UK saw the arrival of the largest container ship. Named Marco Polo after the explorer, the container ship measures a whopping 1,299ft long by 177ft wide. The vessel is longer than four football pitches. 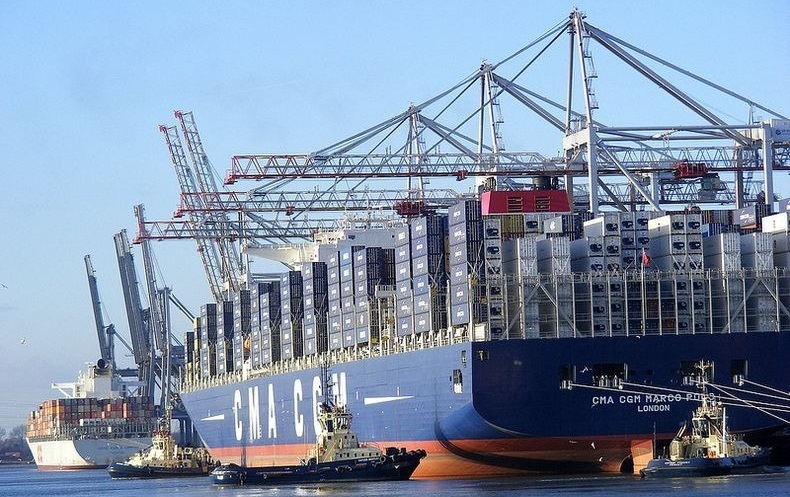 The container vessel, owned by CMA CGM can hold up to 16,000 containers; it’s this capacity that makes it the world’s largest sea freight container ship. New technology incorporated into new container ships such as the Marco Polo, for example, the advances in hydrodynamics, decrease CO2 emissions and energy consumption. The ship’s electronically controlled engine uses an average of three percent less fuel than a regular engine. Provisions to prevent oil leaks (via a specially designed double hull) and reducing the transfer of micro-organisms from one ocean to another (via a water treatment system) have also been made. Advances such as these make new container ships more environmentally friendly and conserving for the marine environment. Competitor Maersk is working on building an even larger ocean freight container ship to hold 18,000 containers, after previously holding the record for the largest shipping vessel with capacity of 11,000 containers. The Marco Polo container ship will adopt a route to link Asia to Northern Europe. As one of the fastest ocean freight services between Asia and the United Kingdom, it also has comprehensive coverage of China, visiting Ningbo, Shanghai, Xiamen and Hong Kong to name a few, visiting Southampton in the UK . Call us today to discuss your import shipment from Asia to the United Kingdom – Tel. 02392 756 575. Email: sales@mercatorcargo.co.uk. Roll-on/Roll-off (otherwise known as RoRo) is a freight forwarding service for wheeled vehicles whereby they are roll on and off the car transporter ship. Suitable for trucks, caravans, vans and cars, Mercator can arrange the shipment of your vehicle to almost any destination worldwide. An alternative freight forwarding service for importing or exporting vehicles is via a shipping container. If shipping a vehicle for export or import in a container, Mercator will arrange for your cargo (be it a car, caravan, or motorcycle) to be secured in its container to ensure safety in transit. This is secured using webbed netting, so that no marks are left on the vehicle whilst it is being transported. RoRo (roll-on/roll-off) and vehicle container shipping are two of the services offered by freight forwarding company Mercator Cargo. Whether you’re looking to export or import a car, a van, motorcycles, or even caravans, Mercator Cargo has the experience and contacts to help you with your shipment. Contact us today to speak to a member of the Operations Department to discuss your RoRo or vehicle shipping requirements – Tel. 02392 756 575. Email: sales@mercatorcargo.co.uk. If you’re looking to export chemicals, Mercator Cargo can help. With trained staff and over 20 years’ experience in international freight forwarding, Mercator has the knowledge and contacts to arrange your export of chemicals from the UK. Even hazardous, dangerous or restricted chemicals are in our remit. When your chemicals both leave the UK and arrive at their destination country, hazard restrictions and regulations may apply, it is vital these are understood. Mercator is able to assist you in understanding these regulations and offer advice with regards to labelling, packaging and documentation. There may be specific regulations about how your chemicals need to be packaged, classified and labelled. Mercator can offer advice with regards to any queries you may have. Still managed and owned by the founding family, we pride ourselves with offering the best customer service at a personal level. Mercator is able to offer a bespoke service to aid you in organising your export shipment of chemicals from the UK. Call today to speak to a member of our Export Department to discuss your export of chemicals from the UK – Tel. 02392 756 575. Email: sales@mercatorcargo.co.uk. At Mercator we can offer a variety of options for refrigerated container transport (also known as reefers) for import into the UK and export from the UK. Some goods will need to be kept at a cooled constant temperature, for example frozen food stuffs, whilst other items (for example candles) may need to be protected from heat or cooler temperatures in a controlled temperature environment. Reefers allow the transportation of perishable goods at any time of year, safe in the knowledge your goods will not spoil. Available in either 20 foot or 40 foot containers, and even part loads – where we can combine your goods with other loads (provided that all the goods can be kept at the same temperature). Combining your load with other goods can keep your costings down. Mercator also offers comprehensive advice and services in all Port Health matters. If importing or exporting food stuffs, your goods will be subject to Port Health clearance. Our experienced team of freight forwarders can advise on all Port Health queries. When importing into the UK your goods will be subject to VAT and Duty charges through customs. We are able to calculate this rate and deal with HMRC clearance. Once your goods have arrived in the UK and your VAT & Duty charges have been settled, Mercator can make arrangements to deliver your shipment to door, either via road haulage or rail. Call today to speak to a member of our Operations Department to discuss your refrigerated shipment – Tel. 02392 756 575. Email: sales@mercatorcargo.co.uk.